This ultra luxury hotel is projected to open at the end of 2018, represents an investment of US$110 million and has 125 rooms that will exceed the highest international standards. 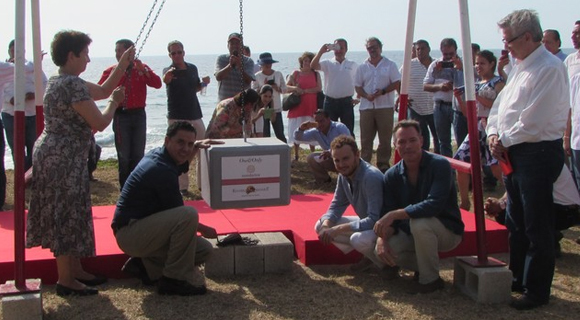 On Monday, May 16, 2016, Roberto Sandoval Castañeda, governor of the State of Nayarit, placed the cornerstone that launched the start of the construction phase of the One&Only Mandarina located in the town of El Monteón, Compostela, in the Riviera Nayarit. Juan Bremer, Managing Director of the Rasaland Development Fund; Ricardo Santa Cruz, Director of La Mandarina development; and Alicia Monroy, Mayor of Compostela all took part in this symbolic event. The One&Only Mandarina will be one of the most luxurious hotels in the world, with only 125 villas set in over 30 hectares for the equivalent of about six villas per hectare. The first phase represents an investment of US$110 million. The upscale resort is a Rick Joy design, with two beach clubs, swimming pools, six restaurants and bars, event rooms, spa, kid’s club and more. “The country is attracting the luxury Asian market that brings with it high quality tourism and visitors that spend a lot of money,” commented Bremer, also assuring those present the resort would not be an all-inclusive property, thus allowing revenue to trickle down into the surrounding community of Nayarit. The La Mandarina complex is projected to include 256 hectares with a total investment of US$870 million. It will boast 4.5 kilometers of waterfront, 1.5 kilometers of which are beach. Among its amenities will be two polo fields and an equestrian center with an obstacle course, among other services. As far as job generation, this newest project in the Riviera Nayarit is expected to bring with it 1,000 direct jobs and eight thousand indirect jobs. Once the resort is in operation, it will generate over 600 direct jobs.